Fiber-reinforced polymer (FRP) composites have experienced revolutionary change in recent years, with respect to both their material properties and manufacturing capabilities. Fiberglass products are now challenging some of the most firmly-entrenched manufacturing materials in their primary applications. Aesthetic architecture is increasingly manufactured using fiberglass products such as EXTREN® structural shapes. This blog post will explore four of the most striking architectural designs using Strongwell fiberglass products. The Vintage Club is a prestigious country club nestled below Eisenhower Mountain in Indian Wells. Community buildings across the resort were crowned with sophisticated pyramidal screenings manufactured from structural timber. This represented biennial maintenance costs of $75,000 as the timber rapidly deteriorated in the desert conditions. Strongwell EXTREN® fiberglass products were used to recreate the mesmerizing structures with a matching beige pigmentation. This new structure was visually indistinct from the original designs with far superior mechanical properties and significantly reduced maintenance costs for Vintage Club owners. 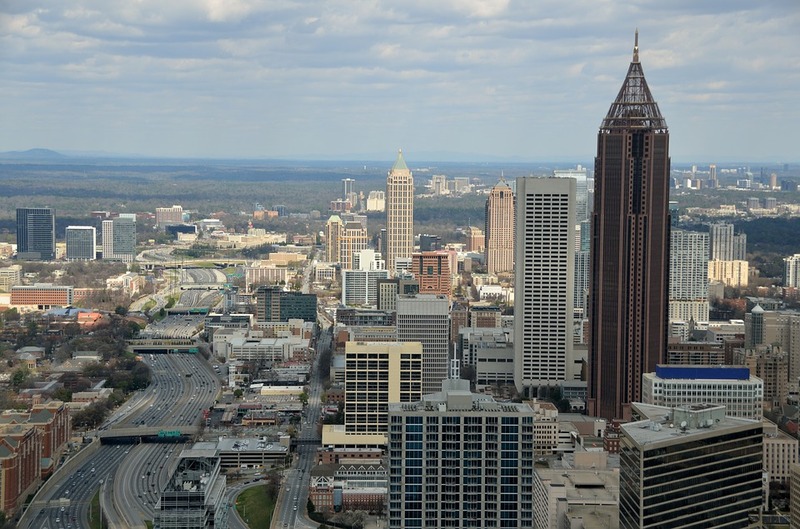 The NationsBank Building, Atlanta is a 55-story megalith topped with a stunning golden spire. This unique structure was constructed of multiple fiberglass products, including fire-retardant EXTREN® shapes. Within the complex spire is a central core of DURASHIELD® panels, providing a novel platform for cellular components with transparency to electromagnetic interference (EMI) and resistance from sustained wind pressures of 80 pounds per square foot (PSF). The Virginia Museum of Fine Arts is fronted with a mesmerizing water feature comprising multiple pumps, water hoses, and a substantial walking surface. This feature is built upon a discrete arrangement of fiberglass products, providing outstanding mechanical and chemical strength in the presence of near-constantly moving fluid. DURAGRATE® fiberglass products with a resistant resin content of 65% provide practically maintenance-free long-service for an uninterrupted aquatic display. Fiberglass products were used to crown the SunTrust Center in Orlando with four distinct turrets that house the cellular antennae of the building in EMI-transparent compartments. These structures remain the highest features of Orlando’s skyline today. You can read more about the fiberglass products used to construct the SunTrust Center in our previous blog post: 5 Surprising Projects Using FRP. Strongwell provides unique material solutions for any architectural application, approaching every project with a truly collaborative mindset. We can customize our fiberglass products with unique resins and pigments to unlock unique, long-lasting mechanical and aesthetic properties to achieve a bespoke architectural impact. Our architectural fiberglass products combine unmatched aesthetic capacities with high mechanical strengths and an inherent imperviousness to rot and chemical corrosion. This provides unique opportunities for architects constructing a striking design for demanding environmental conditions. Heavy winds, severe thermal cycling, high-humidity, or constant precipitation can ruin the practicality of any beautiful design. Fiberglass products succeed where aluminum, steel, and wood may fail. If you would like any more information about our fiberglass products, please do not hesitate to contact us.